The ancient Romans described this as “gravitas” – from feats achieved in battle. It is a depth of personal power that is resident within the man – it is not spoken, it is achieved by actions. It is inherent in the man and commands respect. There is a psychological barrier crossed when a young boy goes through a rite-of-passage to become a young man – to achieve mana/gravitas. This is usually attained by the young boy confronting his mortality. Every act of courage after will increase his mana, be celebrated by his community and increase his status in the process. And better equip him to deal with adult life. The Haka is a ritual of manhood and for each All Black a display of courage will increase his mana and be acknowledged by his community. This is the Polynesian way – men use rugby as a vehicle to achieve mana, as did the Roman soldiers feats in battle added to their gravitas. Men are not only unified in achieving mana for themselves but also for their team. Australia has no equivalent depth of motivational tool. As the Australian coach you are always looking to motivate a super human performance from your players and win the day. So how to achieve that equivalent motivation? Seize on any opportunity that disrespects the players – the more layers of disrespect the better. 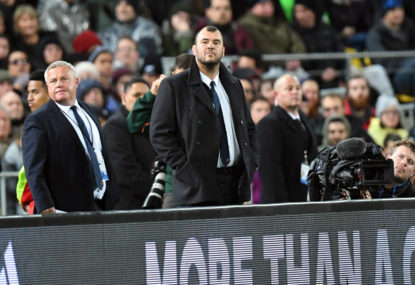 Cheika has headed to the trenches courtesy of the clown depiction in the New Zealand press. The Wallabies now will have to regain lost respect and in doing so go to their primal instincts to prove their manhood. There can be no greater motivation for a man. This will be the Wallaby mantra until the Spring Tour . Expect the Wallaby passion to go a new level. Perhaps the next Haka will be respectfully met with the Wallabies lined up shoulder-to-shoulder in a V formation (old military arrowhead attack formation) with the captain at the head – all with arms folded.